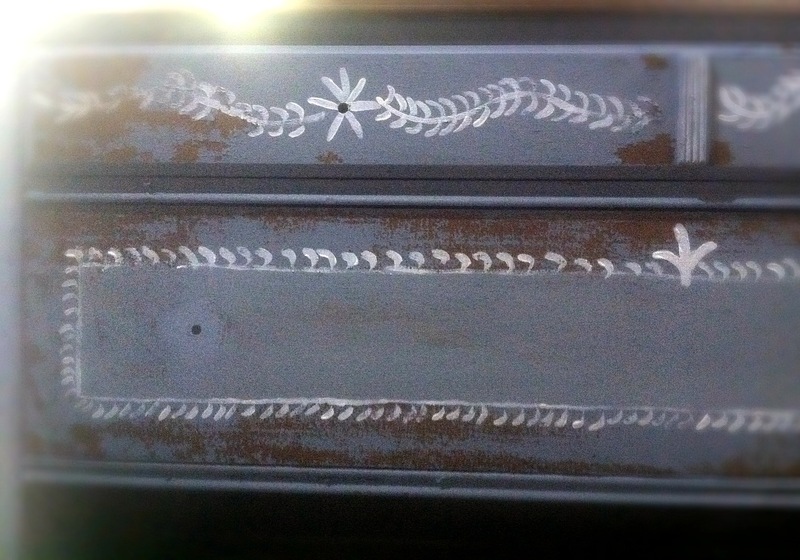 A dear friend saved this dresser for me . 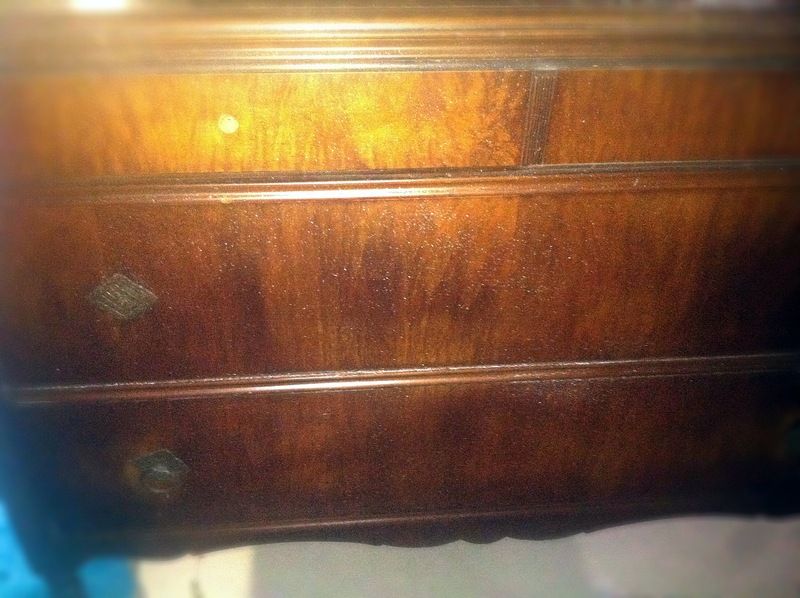 She (the dresser) was in great sturdy shape but had some scratches on top and splatters of paint all over front. This making her a great candidate for paint. I have been dying to do some decorative paint on this piece but the colors I couldn’t decide so she sat in my garage for 2 months … until this weekend I woke up and was motivated to move this piece into my studio in the basement. Still not knowing what color or when I would paint it. 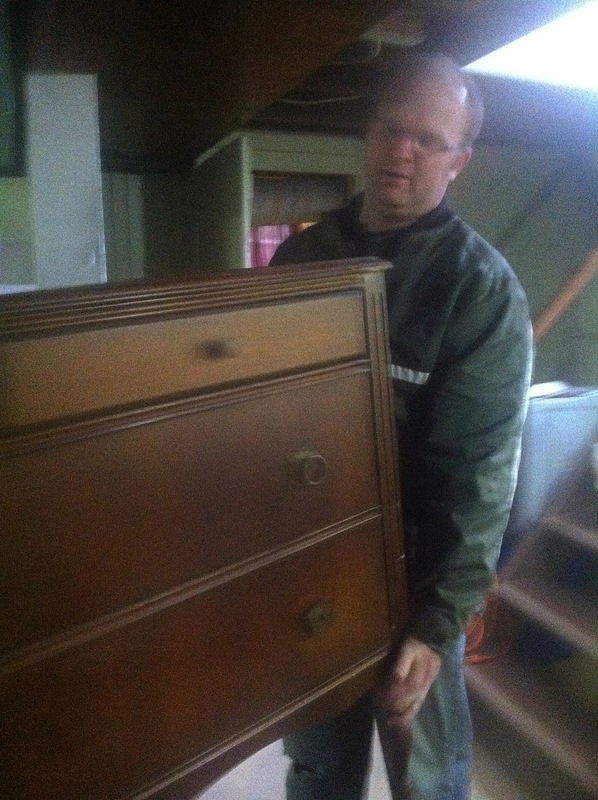 So my dear hubby and sweet brother in law carried her into the basement this past weekend ( yep, in the rain). They look so happy , don’t they ?! Well it turns out later Sunday night inspiration was about to strike, you just never know when or how. I make it a rule to not paint or sew before inspiration hits. Sunday night my sweet neighbors stopped by with a gift basket I had won. They own a sweet little store called Black Dogs Antiques. MY 9 year old and I had stopped their Holiday open house with me on Saturday , she signed me up for the drawing. I am not one of those people who ever win these sorts of things but was so excited Sunday evening when they showed up with a basket full of goodies !!! 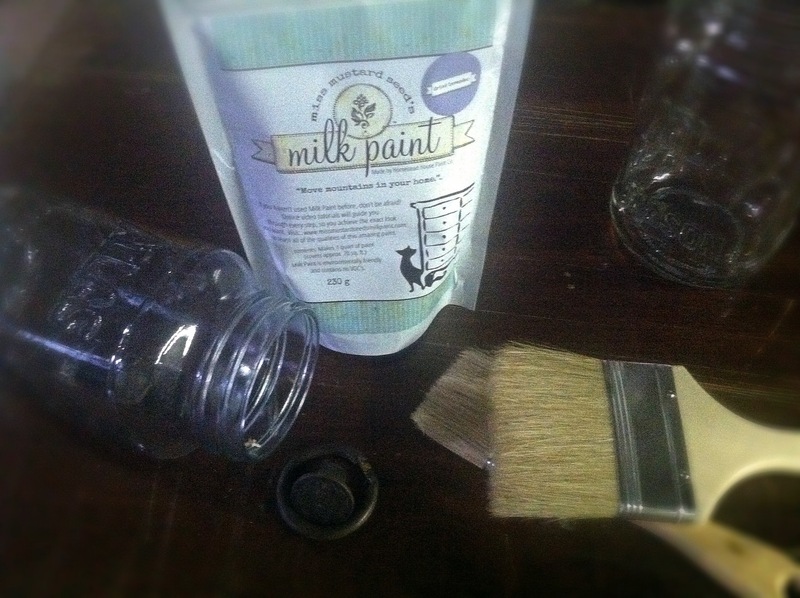 One of the goodies included Dried Lavender Milk Paint by Miss Mustard Seed. Bam!!! 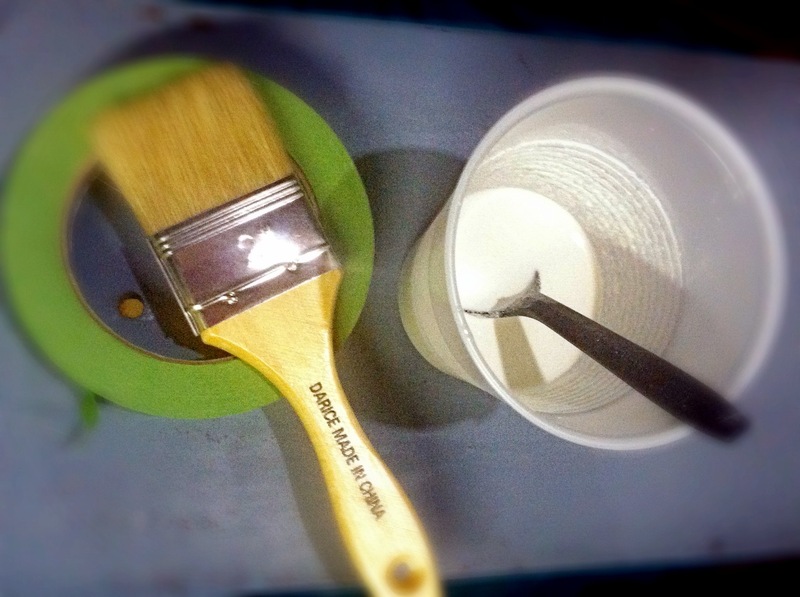 that is the perfect color for my project, simple as that. I begin doodling and mixing a white wash too , this piece is girlie. I love super chippy looks on pieces of furniture, I can show the beauty of the wood but still make the piece even beautiful with paint. The Chippy look is not for every piece but this one for sure. 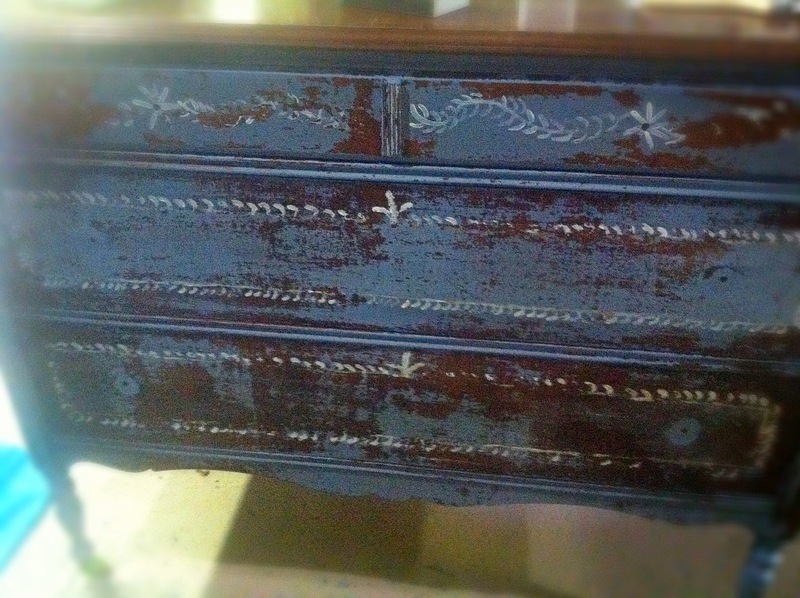 I started by painting the drawers , sides and legs 2 coats dried lavender (no bonding agent). I then pulled out my Frog Tape ( love this stuff ). 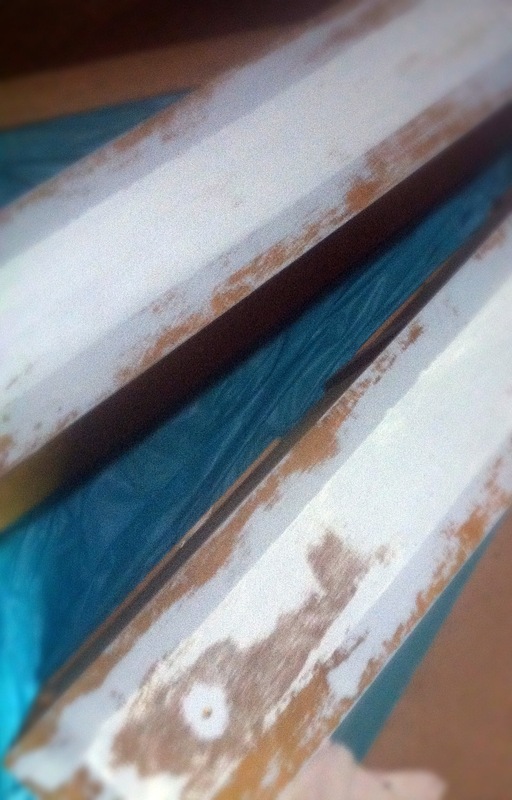 Got my white wash handy and went to work taping a boarder. 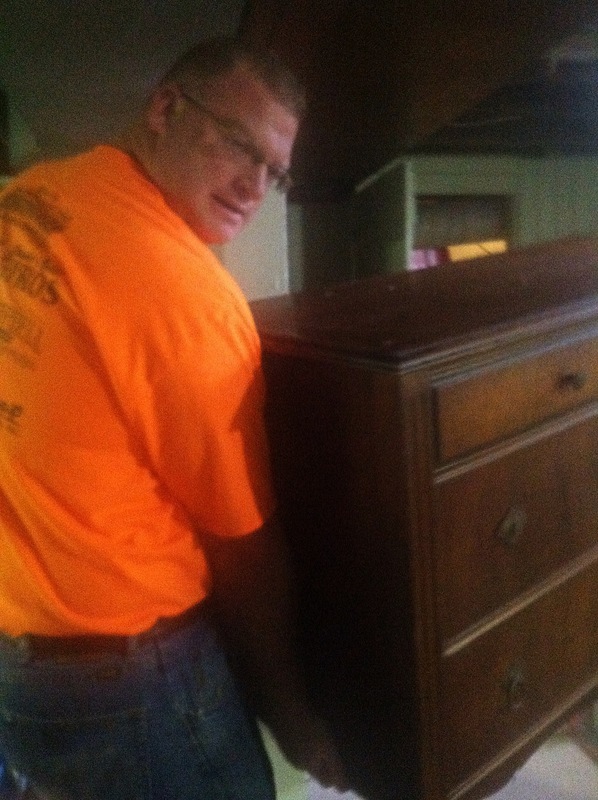 I white washed just the center of the drawer. I love this look and I remember seeing this on MMS blog and made a mental note of the technique. I painted the wash on and then used a towel to wipe off. I painted right over the chippy paint. After it dried I took the frog tape off. It lifted some of the loose paint for me . 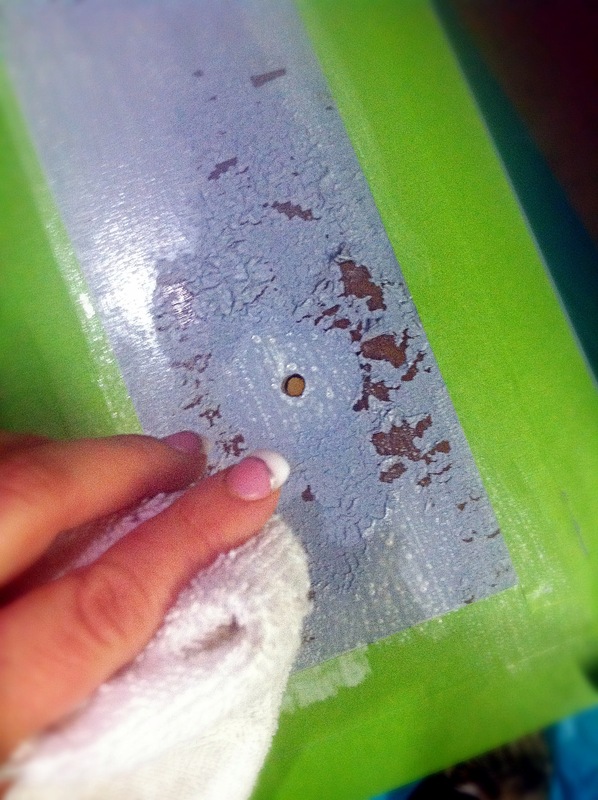 Then I used a spackling tool to gently scrape off rest of the loose paint. 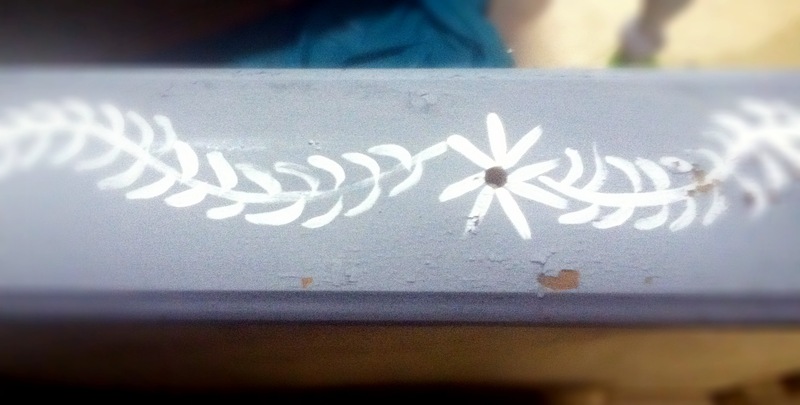 Next, I used some inexpensive paint brushes from a value pack at walmart , some acrylic paint and freehanded my design. I love the natural look you get and no I am not an artist (as you can tell), I just use simple shapes to make ( like I do with my sewing appliques). So anyone can do this , just a little practice. 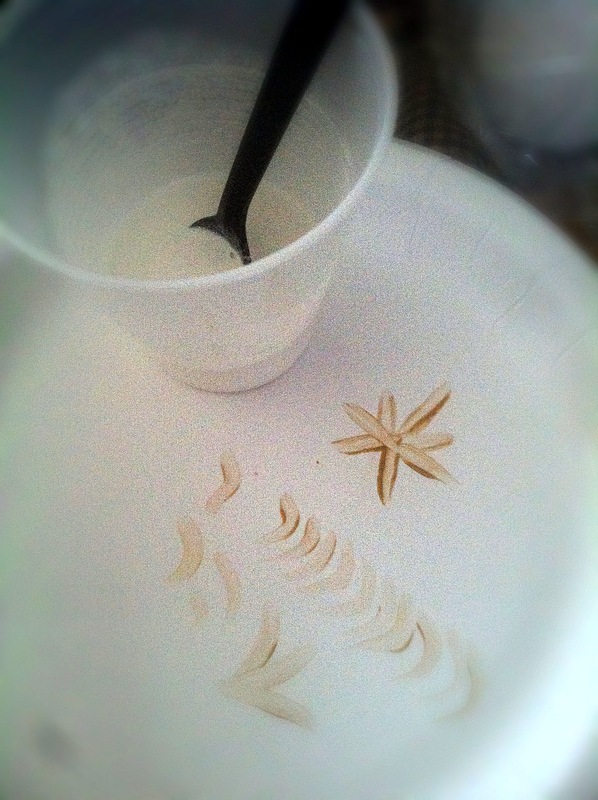 I used white acrylic paint and a antique gold acrylic paint to highlight. Before I sanded I sealed with a Hemp oil. I did this for two reasons. One too add life back to the wood that I was leaving shown and two if you apply the hemp oil before you sand you get a buttery smooth finish. 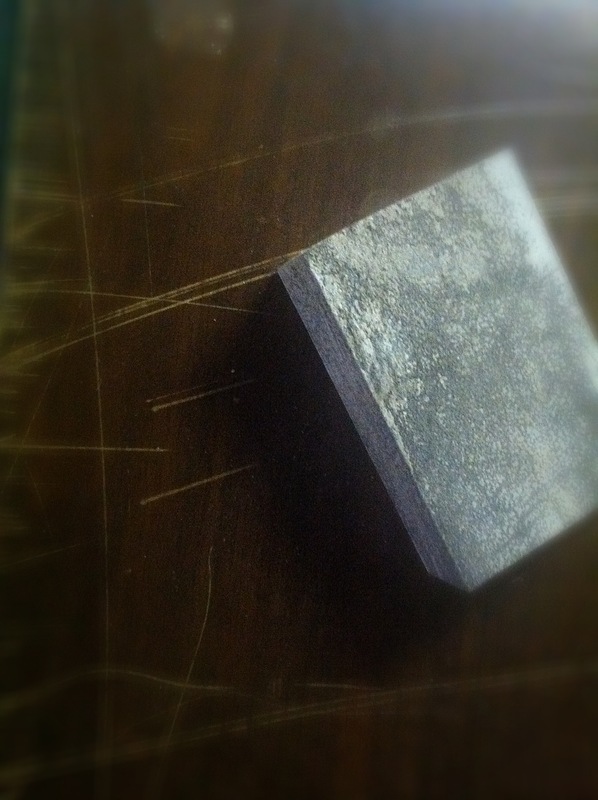 Even though the piece looks rough and chippy , its smooth to touch. I will be sure to post a picture when done. But here is a sneak…. Isnt it funny how things simply just work out? You never know when inspiration is going to hit. Here is the inspiration behind this piece and how could these pictures not inspire you !?! Love the finish! Fabulous! 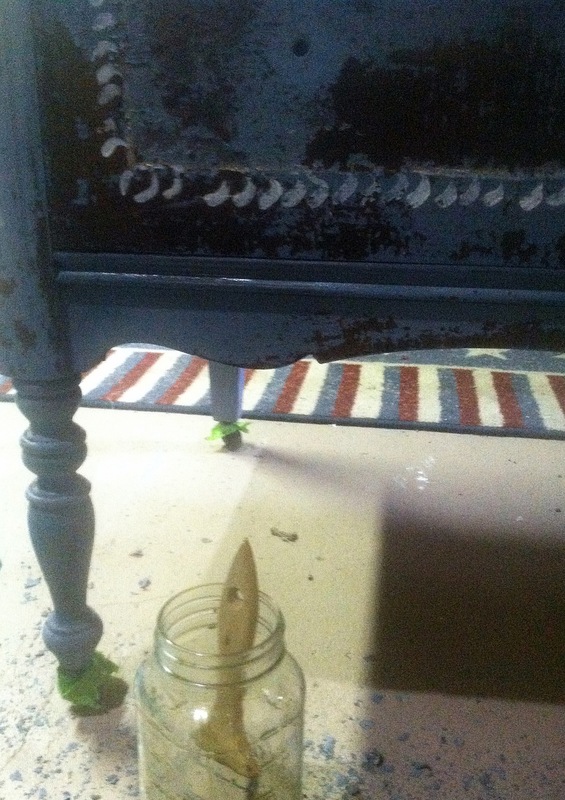 I’m a Miss Mustard Seed retailer in Birmingham, Alabama, and so happy to see others posting about this fabulous paint!! !